Tuna and Hummus on Toasted Baguettes or What’s for Lunch? There is nothing fancy about this except maybe the presentation. When you want something besides a plain tuna fish sandwich for lunch this is just the thing. The recipe is in Ina Garten’s new cookbook How Easy is That? I would give you the recipe but The Barefoot Bloggers have requested that we not publish the recipes from this book unless they have already been posted on the food network. But how hard can this be? You just toast sourdough bagettes, spread them with store bought hummus, or homemade if you have it, and top it with your favorite tuna salad mixture. The radishes give it a festive touch. I would recommend using a good quality tuna though. I no longer buy water packed tuna, even though it may be saving a few calories. Oil packed tuna has a much better flavor. When we are in Florida we tend to have people who stop in for lunch, so I am always on the lookout for interesting luncheon dishes. Here are a few other suggestions from previous posts. This four layer salad has a real wow factor. 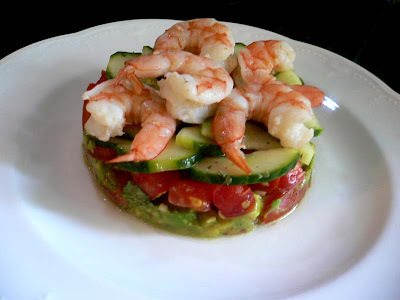 Guacamole, tomato salad, cucumber salad, and shrimp form a tower of goodness. I think the next time I serve it, I will put it on a bed of greens. You can find the recipe here. Soup is always a good choice for lunch. 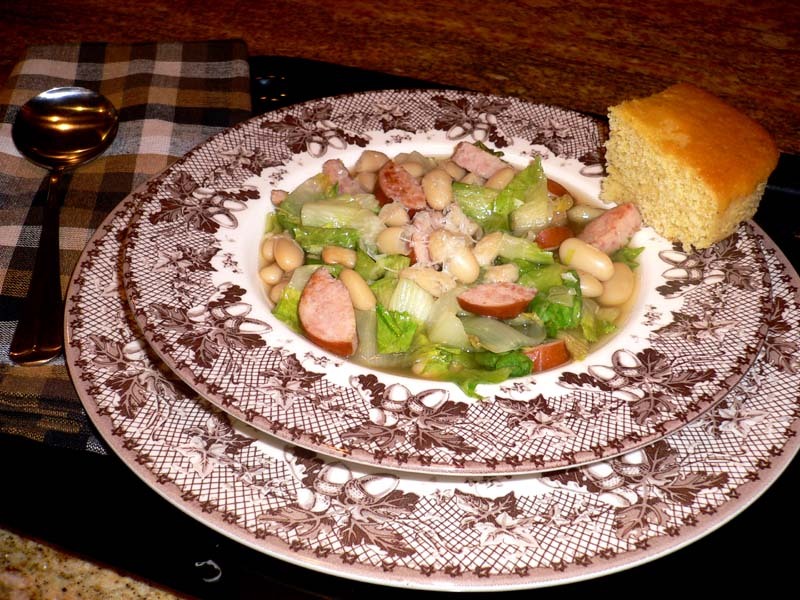 Escarole, white bean and sausage soup is one of my easy favorites. It is great served with cornbread. You can find the recipe here. Instead of having quiche for lunch, try this tasty black bean tart with easy chili crust. A refreshing salad with avocado and orange slices would be the perfect side dish. The recipe for the tart can be found here. These are a few of my favorite lunches. After being under the weather for a week, I am ready to tackle Christmas. Posted on December 6, 2010 at 8:08 am. 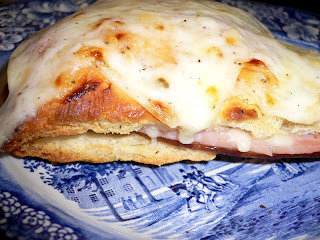 I would like to offer a special thanks to Kathy of All Food Considered for choosing Croque Monsieur for the second Barefoot Contessa recipe this month. My passion for French food is long standing, but I had never made this decadent sandwich before. 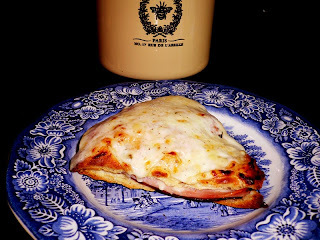 Perhaps it is because it is so decadent; bread, ham, cheese, white sauce and more cheese. I hate to admit it but I do not have a natural affinity for cheese. There was a time when I would not touch the stuff, but over the years I have allowed certain cheeses to prove their goodness to me. Gruyere is one of those cheeses. I think I learned to like it during the fondue era of the 70’s. Parmesan is another favorite and I liberally slather pizzas with it. So Croque Monsieur appealed to me on all levels and it did not disappoint. The only change I made to the recipe was the bread. Ina uses Pepperidge Farm white bread and although I like it, I like my Bread Machine Rosemary Focaccia better. I will include that recipe also. The recipe came from a Better Homes and Gardens Bread Machine cookbook. Add first six ingredients in the order given to the bread machine. Process on the dough setting. Remove dough from bread machine. Cover and let rest for ten minutes. 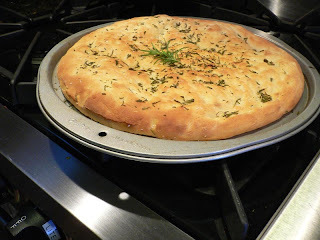 Grease a 12″ round pizza pan. Roll or pat dough into pan. Cover and let rise for 30 minutes. Heat oven to 400 degrees. Make depressions in dough with fingertips. Drizzle with olive oil. Sprinkle with rosemary and coarse salt. Bake 15 to 18 minutes. Melt the butter over low heat in a small saucepan and add the flour all at once, stirring with a wooden spoon for 2 minutes. Slowly pour the hot milk into the butter-flour mixture and cook, whisking constantly, until the sauce is thickened. Off the heat add the salt, pepper, nutmeg, 1/2 cup grated Gruyere, and the Parmesan and set aside. To toast the bread, place the slices on 2 baking sheets and bake for 5 minutes. Turn each slice and bake for another 2 minutes, until toasted. Lightly brush half the toasted breads with mustard, add a slice of ham to each, and sprinkle with half the remaining Gruyere. Top with another piece of toasted bread. Slather the tops with cheese sauce, sprinkle with the remaining Gruyere, and bake the sandwiches for 5 minutes. Turn on the broiler and broil for 3 to 5 minutes, or until the topping is bubbly and lightly browned. Serve hot. Makes 8 sandwiches. Posted on April 23, 2009 at 11:35 am.